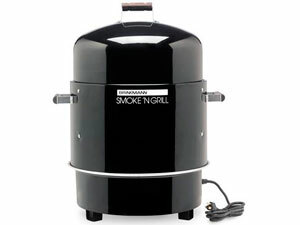 Brinkmann Smoke-N-Grill electric Smoker and Grill is compact, easy to assemble and simple to use. It has a nice design, performs well, and cleaning after the smoking is done is not a hassle. Though some find it user friendly, others find it hard to handle, poorly designed, and thus, performs unsatisfactorily. Using a screwdriver and a pair of pliers, assembling is easy. The unit comes with a guide and a recipe book. The electric water smoker produces best tasting, moist, and tender meat without the hint of charcoal or gas in the food. Just turn the thermostat on and it starts smoking. This unit is solid and compact yet it could hold as much food as the big ones. It consists of two spacious racks and a nice big water bowl. Adding more wood chips can be done easily because the smoker’s body can be lifted up with the racks and water bowl. The steam moisturizes and tenderizes the meat during smoking as the water helps keep the meat temperature down increasing the smoking time for better tasting food. This unit can accommodate to smoke different types of food all at once. Dismantling the smoker and cleaning up is faster and easier to do since there are no fumes from charcoal starter. It is poorly packaged and not very user friendly; unit assembly takes a while to put together. This smoker is poorly designed as its wall is basically just a thin sheet of metal allowing the internal temperature to be influenced by the external temperature. The water pan is just plain steel and painted only with a black non-stick coating. Furthermore, there is no temperature gauge and does not come with a cover. The top does not fit perfectly; there is a 1 in. gap between the lid and the base allowing heat to come out. The absence of a temperature gauge makes it difficult to determine the actual temperature. It only has a meter which indicates cold, ideal or hot. Maintaining the temperature is a struggle; resulting to longer cooking time.